V.V. 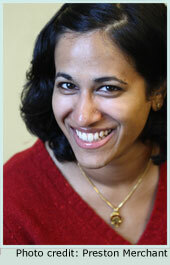 Ganeshananthan, an exceptional Sri Lankan American prose writer, is the author of Love Marriage, a novel. Written in a lyrical and catchy vignette style, this is the story of a a daughter of Sri Lankan immigrants and her journey through her family's roots and politics. A fiction writer and journalist, Ganeshananthan is a graduate of Harvard College, the Iowa Writers’ Workshop, and the M.A. program at Columbia University’s Graduate School of Journalism. Sugi currently teaches creative writing at the University of Michigan, blogs for Sepia Mutiny and continues to write fiction. 1. Tell us about the genesis of your book Love Marriage. I wrote the first pages of Love Marriage—which are still the first pages of Love Marriage!—for a writing course I was taking with Jamaica Kincaid. She liked to have us read our work aloud in class, and when it was my turn, the class responded very positively to the story and wanted more. They were very kind about it. I wasn’t thinking of writing a book, particularly. Or to be more precise, I wanted to write a book, but I had no idea that that was the beginning of one. I’m grateful that I was part of a community of readers and writers that encouraged and supported me. 2. What were your biggest challenges writing this book? It was a challenge to structure it, and to carve out the parts that weren’t necessary. It’s got lots of tiny bits, and each one had to justify itself. In one rewrite, I got rid of a character I thought was redundant; in another, I added one in. (The Kumaran character wasn’t in the first draft. It was a lot of work to invent him and put him in.) And of course, writing the historical parts was hard. A couple of scholars I trust were incredibly helpful. There are places where I chose to diverge from history and fact, but I wanted to know what they were and to have good reasons for doing it, and they really helped me to hash it out. 3. I loved the format of this book. It was almost like a thematic collection of flash fiction. Why did you choose to write in this style? will you do it again? Thanks so much for the compliment! I’m glad you liked it. Your question very generously presumes a conscious decision. At first, it was more subconscious—that was just how it started when I was noodling around. But then it made sense to continue that way because it’s a family story. What family gives you the whole story, let alone in order? So the structure of the book mimics the long and fragmented process of listening that families require. 4. Do you have any one favorite author, a role model? What do you like best about them? I’ve been fortunate to have some life-altering teachers, and they were always role models for me. So no one favorite author—more like tons of them. I read a lot of Ondaatje as a kid, and that was certainly formative. I’m excited for his new book. His language is so beautiful. I also love Shyam Selvadurai’s work, and teach Funny Boy in my political fiction class. It has such a great structure. And I always find myself returning to The Sound and the Fury. I also read the news obsessively. I find many things about journalism very useful for my fiction. 5. What do you believe are the biggest challenges faced by aspiring fiction writers today? There’s a lot of noise about how publishing and reading and libraries and writing and fiction and newspapers and education and all things sane are waning rather than waxing. The economy is terrible and nobody cares about art only about security and the Rapture is going to be any minute now and who cares about your book or about other humans generally. To withstand what is sometimes a kind of gleeful anticipation of entropy is hard, especially when you agree that the sainted institutions of reading and writing need defending. As a kid I had a copy of this cartoon—a guy on the street holding up a sign that said something like THE END IS NOT NEAR WE MUST LEARN TO COPE. It’s hard to read and write when people are always announcing how little your reading and writing are going to matter. As a kid, I didn’t hear anything like that, and now I hear it all the time. But I’m heartened that so many people are still doing it and insisting that it does matter and encouraging others to do it too. For me, the trick seems to be not to defeat myself before I’m even out the gate. I try to do whatever I want pretending as seriously as I can that there are no obstacles to that. Of course, sometimes harsh reality intrudes, and then you have to deal with whatever problem, but as much as possible, I want saying no to be someone else’s job, not mine. So for me maybe the biggest challenge is to not listen to that alleged apocalypse knocking on the door. Although I’m more grateful than I expected for the deluge of Rapture jokes. 6. Are you working on your next book project? When will it be published? Would you like to say something about it?